'I suppose you will be getting away pretty soon, now Fall term is over, Professor,' said a person not in the story to the Professor of Ontography, soon after they had sat down next to each other at a feast in the hospitable hall of St James's College. It was, as you might suppose, a person of antiquarian pursuits who said this, but, since he merely appears in this prologue, there is no need to give his entitlements. 'Do you call having an extra bed in your room roughing it. Parkins?' said a bluff person opposite. 'Look here, I shall come down and occupy it for a bit; it'll be company for you.' The Professor quivered, but managed to laugh in a courteous manner. 'Well, if you want the exact truth, Rogers, I was considering whether the room I speak of would really be large enough to accommodate us both comfortably; and also whether (mind, I shouldn't have said this if you hadn't pressed me) you would not constitute something in the nature of a hindrance to my work.' Rogers laughed loudly. 'No, you certainly have not, old man,' put in Rogers sotto voce. In repeating the above dialogue I have tried to give the impression which it made on me, that Parkins was something of an old woman - rather hen-like, perhaps, in his little ways; totally destitute, alas! of the sense of humour, but at the same time dauntless and sincere in his convictions, and a man deserving of the greatest respect. Whether or not the reader has gathered so much, that was the character which Parkins had. On the following day Parkins did, as he had hoped, succeed in getting away from his college, and in arriving at Burnstow. He was made welcome at the Globe Inn, was safely installed in the large double-bedded room of which we have heard, and was able before retiring to rest to arrange his materials for work in apple-pie order upon a commodious table which occupied the outer end of the room, and was surrounded on three sides by windows looking out seaward; that is to say, the central window looked straight out to sea, and those on the left and right commanded prospects along the shore to the north and south respectively. On the south you saw the village of Burnstow. On the north no houses were to be seen, but only the beach and the low cliff backing it. Immediately in front was a strip - not considerable - of rough grass, dotted with old anchors, capstans, and so forth; then a broad path; then the beach. Whatever may have been the original distance between the Globe Inn and the sea, not more than sixty yards now separated them. The rest of the population of the inn was, of course, a golfing one, and included few elements that call for a special description. The most conspicuous figure was, perhaps, that of an ancien militaire, secretary of a London club, and possessed of a voice of incredible strength, and of views of a pronouncedly Protestant type. These were apt to find utterance after his attendance upon the ministrations of the Vicar, an estimable man with inclinations towards a picturesque ritual, which he gallantly kept down as far as he could out of deference to East Anglian tradition. Professor Parkins, one of whose principal characteristics was pluck, spent the greater part of the day following his arrival at Burnstow in what he had called improving his game, in company with this Colonel Wilson: and during the afternoon - whether the process of improvement were to blame or not, I am not sure - the Colonel's demeanour assumed a colouring so lurid that even Parkins jibbed at the thought of walking home with him from the links. He determined, after a short and furtive look at that bristling moustache and those incarnadined features, that it would be wiser to allow the influences of tea and tobacco to do what they could with the Colonel before the dinner-hour should render a meeting inevitable. 'I might walk home tonight along the beach,' he reflected - 'yes, and take a look - there will be light enough for that - at the ruins of which Disney was talking. I don't exactly know where they are, by the way; but I expect I can hardly help stumbling on them.' This he accomplished, I may say, in the most literal sense, for in picking his way from the links to the shingle beach his foot caught, partly in a gorse-root and partly in a biggish stone, and over he went. When he got up and surveyed his surroundings, he found himself in a patch of somewhat broken ground covered with small depressions and mounds. These latter, when he came to examine them, proved to be simply masses of flints embedded in mortar and grown over with turf. He must, he quite rightly concluded, be on the site of the preceptory he had promised to look at. It seemed not unlikely to reward the spade of the explorer; enough of the foundations was probably left at no great depth to throw a good deal of light on the general plan. He remembered vaguely that the Templars, to whom this site had belonged, were in the habit of building round churches, and he thought a particular series of the humps or mounds near him did appear to be arranged in something of a circular form. Few people can resist the temptation to try a little amateur research in a department quite outside their own, if only for the satisfaction of showing how successful they would have been had they only taken it up seriously. Our Professor, however, if he felt something of this mean desire, was also truly anxious to oblige Mr Disney. So he paced with care the circular area he had noticed, and wrote down its rough dimensions in his pocket-book. Then he proceeded to examine an oblong eminence which lay east of the centre of the circle, and seemed to his thinking likely to be the base of a platform or altar. At one end of it, the northern, a patch of the turf was gone - removed by some boy or other creature ferae naturae. It might, he thought, be as well to probe the soil here for evidences of masonry, and he took out his knife and began scraping away the earth. And now followed another little discovery: a portion of soil fell inward as he scraped, and disclosed a small cavity. He lighted one match after another to help him to see of what nature the hole was, but the wind was too strong for them all. By tapping and scratching the sides with his knife, however, he was able to make out that it must be an artificial hole in masonry. It was rectangular, and the sides, top, and bottom, if not actually plastered, were smooth and regular. Of course it was empty. No! As he withdrew the knife he heard a metallic clink, and when he introduced his hand it met with a cylindrical object lying on the floor of the hole. Naturally enough, he picked it up, and when he brought it into the light, now fast fading, he could see that it, too, was of man's making - a metal tube about four inches long, and evidently of some considerable age. By the time Parkins had made sure that there was nothing else in this odd receptacle, it was too late and too dark for him to think of undertaking any further search. What he had done had proved so unexpectedly interesting that he determined to sacrifice a little more of the daylight on the morrow to archaeology. The object which he now had safe in his pocket was bound to be of some slight value at least, he felt sure. He blew tentatively and stopped suddenly, startled and yet pleased at the note he had elicited. It had a quality of infinite distance in it, and, soft as it was, he somehow felt it must be audible for miles round. It was a sound, too, that seemed to have the power (which many scents possess) of forming pictures in the brain. He saw quite clearly for a moment a vision of a wide, dark expanse at night, with a fresh wind blowing and in the midst a lonely figure - how employed, he could not tell. Perhaps he would have seen more had not the picture been broken by the sudden surge of a gust of wind against his casement, so sudden that it made him look up, just in time to see the white glint of a sea-bird's wing somewhere outside the dark panes. The first thing was to get the window shut. While you might count twenty Parkins was struggling with the small casement, and felt almost as if he were pushing back a sturdy burglar, so strong was the pressure. It slackened all at once, and the window banged to and latched itself. Now to relight the candles and see what damage, if any, had been done. No, nothing seemed amiss; no glass even was broken in the casement. But the noise had evidently roused at least one member of the household: the Colonel was to be heard slumping in his stockinged feet on the floor above, and growling. Quickly as it had risen, the wind did not fall at once. On it went, moaning and rushing past the house, at times rising to a cry so desolate that, as Parkins disinterestedly said, it might have made fanciful people feel quite uncomfortable; even the unimaginative, he thought after a quarter of an hour, might be happier without it. Whether it was the wind, or the excitement of golf, or of the researches in the preceptory that kept Parkins awake, he was not sure. Awake he remained, in any case, long enough to fancy (as I am afraid I often do myself under such conditions) that he was the victim of all manner of fatal disorders: he would lie counting the beats of his heart, convinced that it was going to stop work every moment, and would entertain grave suspicions of his lungs, brain, liver, etc. - suspicions which he was sure would be dispelled by the return of daylight, but which until then refused to be put aside. He found a little vicarious comfort in the idea that someone else was in the same boat. A near neighbour (in the darkness it was not easy to tell his direction) was tossing and rustling in his bed, too. The next stage was that Parkins shut his eyes and determined to give sleep every chance. Here again overexcitement asserted itself in another form - that of making pictures. Experto crede, pictures do come to the closed eyes of one trying to sleep, and are often so little to his taste that he must open his eyes and disperse them. Parkins's experience on this occasion was a very distressing one. He found that the picture which presented itself to him was continuous. When he opened his eyes, of course, it went; but when he shut them once more it framed itself afresh, and acted itself out again, neither quicker nor slower than before. What he saw was this: A long stretch of shore - shingle edged by sand, and intersected at short intervals with black groynes running down to the water - a scene, in fact, so like that of his afternoon's walk that, in the absence of any landmark, it could not be distinguished therefrom. The light was obscure, conveying an impression of gathering storm, late winter evening, and slight cold rain. On this bleak stage at first no actor was visible. Then, in the distance, a bobbing black object appeared; a moment more, and it was a man running, jumping, clambering over the groynes, and every few seconds looking eagerly back. The nearer he came the more obvious it was that he was not only anxious, but even terribly frightened, though his face was not to be distinguished. He was, moreover, almost at the end of his strength. On he came; each successive obstacle seemed to cause him more difficulty than the last. 'Will he get over this next one?' thought Parkins; 'it seems a little higher than the others.' Yes; half-climbing, half throwing himself, he did get over, and fell all in a heap on the other side (the side nearest to the spectator). There, as if really unable to get up again, he remained crouching under the groyne, looking up in an attitude of painful anxiety. So far no cause whatever for the fear of the runner had been shown; but now there began to be seen, far up the shore, a little flicker of something light-coloured moving to and fro with great swiftness and irregularity. Rapidly growing larger, it, too, declared itself as a figure in pale, fluttering draperies, ill-defined. There was something about its motion which made Parkins very unwilling to see it at close quarters. It would stop, raise arms, bow itself toward the sand, then run stooping across the beach to the water-edge and back again; and then, rising upright, once more continue its course forward at a speed that was startling and terrifying. The moment came when the pursuer was hovering about from left to right only a few yards beyond the groyne where the runner lay in hiding. After two or three ineffectual castings hither and thither it came to a stop, stood upright, with arms raised high, and then darted straight forward towards the groyne. It was at this point that Parkins always failed in his resolution to keep his eyes shut. With many misgivings as to incipient failure of eyesight, over-worked brain, excessive smoking, and so on, he finally resigned himself to light his candle, get out a book, and pass the night waking, rather than be tormented by this persistent panorama, which he saw clearly enough could only be a morbid reflection of his walk and his thoughts on that very day. The scraping of match on box and the glare of light must have startled some creatures of the night - rats or what not - which he heard scurry across the floor from the side of his bed with much rustling. Dear, dear! the match is out! Fool that it is! But the second one burnt better, and a candle and book were duly procured, over which Parkins pored till sleep of a wholesome kind came upon him, and that in no long space. For about the first time in his orderly and prudent life he forgot to blow out the candle, and when he was called next morning at eight there was still a flicker in the socket and a sad mess of guttered grease on the top of the little table. After breakfast he was in his room, putting the finishing touches to his golfing costume - fortune had again allotted the Colonel to him for a partner - when one of the maids came in. In a very short time the maid was back with the blanket. 'Which bed should I put it on, sir?' she asked. 'What? Why, that one - the one I slept in last night,' he said, pointing to it. 'Oh yes, to be sure, sir. Thank you, sir. It's no trouble. I'm sure,' said the maid, and departed to giggle with her colleagues. Parkins set forth, with a stern determination to improve his game. I am glad to be able to report that he succeeded so far in this enterprise that the Colonel, who had been rather repining at the prospect of a second day's play in his company, became quite chatty as the morning advanced; and his voice boomed out over the flats, as certain also of our own minor poets have said, 'like some great bourdon in a minster tower'. 'I don't know about superstition,' said the Colonel. 'They believe in it all over Denmark and Norway, as well as on the Yorkshire coast; and my experience is, mind you, that there's generally something at the bottom of what these country-folk hold to, and have held to for generations. But it's your drive' (or whatever it might have been: the golfing reader will have to imagine appropriate digressions at the proper intervals). 'In nothing whatever of that kind,' returned Parkins firmly. Parkins was on the point of answering that, in his opinion, the Sadducees were the most sensible persons he had ever read of in the Old Testament; but, feeling some doubt as to whether much mention of them was to be found in that work, he preferred to laugh the accusation off. The audience had been a little restive under this harangue, and Parkins had, I fear, fallen somewhat into the tone of a lecturer; but at the last sentence the Colonel stopped. 'Whistling, were you?' he said. 'And what sort of whistle did you use? Play this stroke first.' Interval. And then Parkins narrated the manner of his discovery of the whistle, upon hearing which the Colonel grunted, and opined that, in Parkins's place, he should himself be careful about using a thing that had belonged to a set of Papists, of whom, speaking generally, it might be affirmed that you never knew what they might not have been up to. From this topic he diverged to the enormities of the Vicar, who had given notice on the previous Sunday that Friday would be the Feast of St Thomas the Apostle, and that there would be service at eleven o'clock in the church. This and other similar proceedings constituted in the Colonel's view a strong presumption that the Vicar was a concealed Papist, if not a Jesuit; and Parkins, who could not very readily follow the Colonel in this region, did not disagree with him. In fact, they got on so well together in the morning that there was no talk on either side of their separating after lunch. Both continued to play well during the afternoon, or, at least, well enough to make them forget everything else until the light began to fail them. Not until then did Parkins remember that he had meant to do some more investigating at the preceptory; but it was of no great importance, he reflected. One day was as good as another; he might as well go home with the Colonel. As they turned the corner of the house, the Colonel was almost knocked down by a boy who rushed into him at the very top of his speed, and then, instead of running away, remained hanging on to him and panting. The first words of the warrior were naturally those of reproof and objurgation, but he very quickly discerned that the boy was almost speechless with fright. Inquiries were useless at first. When the boy got his breath he began to howl, and still clung to the Colonel's legs. He was at last detached, but continued to howl. 'What in the world is the matter with you? What have you been up to? What have you seen?' said the two men. 'What window?' said the irritated Colonel. 'Come, pull yourself together, my boy.' 'The front winder it was, at the 'otel,' said the boy. At this point Parkins was in favour of sending the boy home, but the Colonel refused; he wanted to get to the bottom of it, he said; it was most dangerous to give a boy such a fright as this one had had, and if it turned out that people had been playing jokes, they should suffer for it in some way. And by a series of questions he made out this story. The boy had been playing about on the grass in front of the Globe with some others; then they had gone home to their teas, and he was just going, when he happened to look up at the front winder and see it a-wiving at him. It seemed to be a figure of some sort, in white as far as he knew - couldn't see its face; but it wived at him, and it warn't a right thing - not to say not a right person. Was there a light in the room? No, he didn't think to look if there was a light. Which was the window? Was it the top one or the second one? The seckind one it was - the big winder what got two little uns at the sides. The youth hurried off with agitated thanks, and the Colonel and Parkins went round to the front of the Globe and reconnoitred. There was only one window answering to the description they had been hearing. They were soon in the passage, and Parkins made as if to open the door. Then he stopped and felt in his pockets. 'This is more serious than I thought,' was his next remark. 'I remember now that before I started this morning I locked the door. It is locked now, and, what is more, here is the key.' And he held it up. 'Now,' he went on, 'if the servants are in the habit of going into one's room during the day when one is away, I can only say that - well, that I don't approve of it at all.' Conscious of a somewhat weak climax, he busied himself in opening the door (which was indeed locked) and in lighting candles. 'No,' he said, 'nothing seems disturbed.' 'Except your bed,' put in the Colonel. 'Excuse me, that isn't my bed,' said Parkins. 'I don't use that one. 'Well, ring and ask,' said the Colonel, and this appealed to Parkins as practical. The maid appeared, and, to make a long story short, deposed that she had made the bed in the morning when the gentleman was in the room, and hadn't been there since. No, she hadn't no other key. Mr Simpson he kep' the keys; he'd be able to tell the gentleman if anyone had been up. This was a puzzle. Investigation showed that nothing of value had been taken, and Parkins remembered the disposition of the small objects on tables and so forth well enough to be pretty sure that no pranks had been played with them. Mr and Mrs Simpson furthermore agreed that neither of them had given the duplicate key of the room to any person whatever during the day. Nor could Parkins, fair-minded man as he was, detect anything in the demeanour of master, mistress, or maid that indicated guilt. He was much more inclined to think that the boy had been imposing on the Colonel. The Colonel turned it over gingerly in the light of the candle. He turned away, leaving Parkins in act to speak at the bottom of the stair, and soon each was in his own bedroom. By some unfortunate accident, there were neither blinds nor curtains to the windows of the Professor's room. The previous night he had thought little of this, but tonight there seemed every prospect of a bright moon rising to shine directly on his bed, and probably wake him later on. When he noticed this he was a good deal annoyed, but, with an ingenuity which I can only envy, he succeeded in rigging up, with the help of a railway-rug, some safety-pins, and a stick and umbrella, a screen which, if it only held together, would completely keep the moonlight off his bed. And shortly afterwards he was comfortably in that bed. When he had read a somewhat solid work long enough to produce a decided wish for sleep, he cast a drowsy glance round the room, blew out the candle, and fell back upon the pillow. He must have slept soundly for an hour or more, when a sudden clatter shook him up in a most unwelcome manner. In a moment he realized what had happened: his carefully-constructed screen had given way, and a very bright frosty moon was shining directly on his face. This was highly annoying. Could he possibly get up and reconstruct the screen? or could he manage to sleep if he did not? For some minutes he lay and pondered over the possibilities; then he turned over sharply, and with all his eyes open lay breathlessly listening. There had been a movement, he was sure, in the empty bed on the opposite side of the room. Tomorrow he would have it moved, for there must be rats or something playing about in it. It was quiet now. No! the commotion began again. There was a rustling and shaking: surely more than any rat could cause. I can figure to myself something of the Professor's bewilderment and horror, for I have in a dream thirty years back seen the same thing happen; but the reader will hardly, perhaps, imagine how dreadful it was to him to see a figure suddenly sit up in what he had known was an empty bed. He was out of his own bed in one bound, and made a dash towards the window, where lay his only weapon, the stick with which he had propped his screen. This was, as it turned out, the worst thing he could have done, because the personage in the empty bed, with a sudden smooth motion, slipped from the bed and took up a position, with outspread arms, between the two beds, and in front of the door. Parkins watched it in a horrid perplexity. Somehow, the idea of getting past it and escaping through the door was intolerable to him; he could not have borne - he didn't know why - to touch it; and as for its touching him, he would sooner dash himself through the window than have that happen. It stood for the moment in a band of dark shadow, and he had not seen what its face was like. Now it began to move, in a stooping posture, and all at once the spectator realized, with some horror and some relief, that it must be blind, for it seemed to feel about it with its muffled arms in a groping and random fashion. Turning half away from him, it became suddenly conscious of the bed he had just left, and darted towards it, and bent over and felt the pillows in a way which made Parkins shudder as he had never in his life thought it possible. In a very few moments it seemed to know that the bed was empty, and then, moving forward into the area of light and facing the window, it showed for the first time what manner of thing it was. But he was not at leisure to watch it for long. With formidable quickness it moved into the middle of the room, and, as it groped and waved, one corner of its draperies swept across Parkins's face. He could not - though he knew how perilous a sound was - he could not keep back a cry of disgust, and this gave the searcher an instant clue. 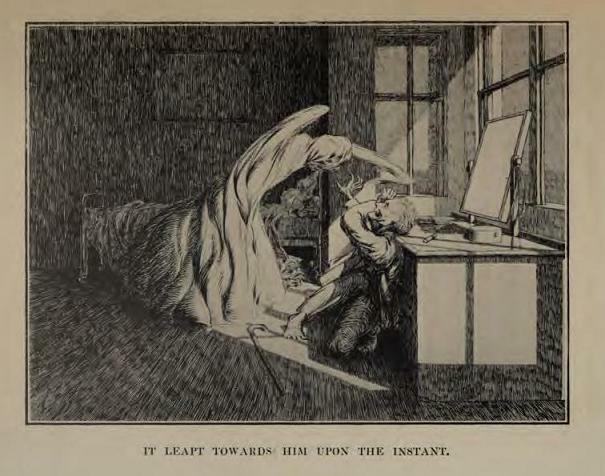 It leapt towards him upon the instant, and the next moment he was half-way through the window backwards, uttering cry upon cry at the utmost pitch of his voice, and the linen face was thrust close into his own. At this, almost the last possible second, deliverance came, as you will have guessed: the Colonel burst the door open, and was just in time to see the dreadful group at the window. When he reached the figures only one was left. Parkins sank forward into the room in a faint, and before him on the floor lay a tumbled heap of bedclothes. Colonel Wilson asked no questions, but busied himself in keeping everyone else out of the room and in getting Parkins back to his bed; and himself, wrapped in a rug, occupied the other bed for the rest of the night. Early on the next day Rogers arrived, more welcome than he would have been a day before, and the three of them held a very long consultation in the Professor's room. At the end of it the Colonel left the hotel door carrying a small object between his finger and thumb, which he cast as far into the sea as a very brawny arm could send it. Later on the smoke of a burning ascended from the back premises of the Globe. Exactly what explanation was patched up for the staff and visitors at the hotel I must confess I do not recollect. The Professor was somehow cleared of the ready suspicion of delirium tremens, and the hotel of the reputation of a troubled house. There is not much question as to what would have happened to Parkins if the Colonel had not intervened when he did. He would either have fallen out of the window or else lost his wits. But it is not so evident what more the creature that came in answer to the whistle could have done than frighten. There seemed to be absolutely nothing material about it save the bedclothes of which it had made itself a body. The Colonel, who remembered a not very dissimilar occurrence in India, was of opinion that if Parkins had closed with it it could really have done very little, and that its one power was that of frightening. The whole thing, he said, served to confirm his opinion of the Church of Rome. There is really nothing more to tell, but, as you may imagine, the Professor's views on certain points are less clear cut than they used to be. His nerves, too, have suffered: he cannot even now see a surplice hanging on a door quite unmoved, and the spectacle of a scarecrow in a field late on a winter afternoon has cost him more than one sleepless night. Add 'Oh, Whistle, and I'll Come to You My Lad' to your own personal library.